How children and teens think about and understand school is important to developing healthy attitudes about learning, now and into the future. 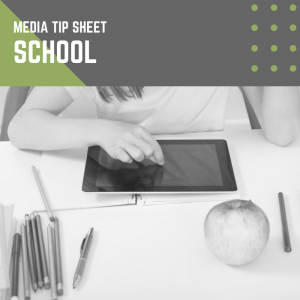 This tip sheet will help you understand how media can positively and negatively affect children’s beliefs about school and learning. Use this information as a guide to help you choose media that are best for your child. Different types of educational media can help children and teens build problem-solving skills, reading skills and, for younger children, general school-readiness skills. Media can help children with their learning, such as watching a video on dinosaurs, or chatting with teens in another country through social media. Media can distract from learning. Multitasking with media, such as texting while trying to do homework, can take away from children’s ability to focus and complete their work. Choose media that are designed to teach children skills that will help them achieve specific learning goals. Find media that engage your child’s interests, and allows them to explore topics outside of the classroom. Set up a homework station where you can monitor children’s media use and be available for any questions. Help keep them focused on tasks by eliminating distractions and reminding them of their goals.